4.5 behind the glass yesterday. This was Flight Scenario 2 in a four-flight series learning to fly a CAP Cessna 182T Nav III with the Garmin G1000 glass cockpit. We launched around 4:00 local and got back around 9:00 with a break at KJXN for fuel and bio break. A pretty exhaustive flight. From KPTK up to KBAX with the RNAV 22 and published miss and hold, over to KMBS with the ILS and published miss, then to KJXN for the VOR 24 before heading back to KPTK for the LOC B/C for 27L. 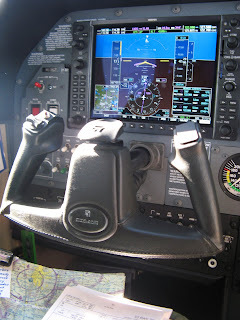 The idea here was for me to do most or all of the flying and the operation of the G100 and the GFC 700 autopilot. This I did. 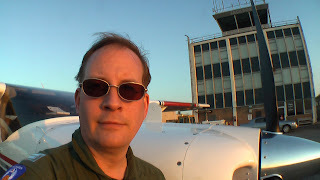 I competently navigated the aircraft, but clearly have a bit of learning to do when nonstandard stuff happens. I was fine when Cleveland Center routed us over to the Peck VOR (ECK) instead of giving us a couple of intersections for which I had asked. It has something to do with the limitation of radar coverage by Cleveland Center over there in Michigan’s thumb. The issues I’m having have largely to do with how to pick up an approach from various places, including how to get the airplane to fly an approach from some intermediate point on the approach. I’m fine if I’m going to fly the thing full-procedure from the IAF. But the moment a controller tries to be helpful and set me up for something less than the full procedure, everything goes to hell and I end up flying it with the heading bug and controlling the VNAV myself with the VS key and the Nose Up/Nose Down. I know that the avionics are capable of doing a lot more than I’m squeezing out of them and that’s both frustrating and a motivation to hit the books and the Garmin-provided PC Trainer to nail it down before the next flight. 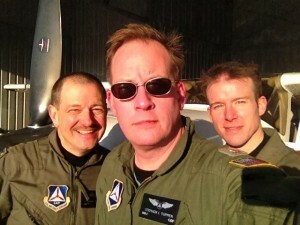 As ever, Michigan Wing check airman Capt Tim Kramer was there in the right seat. A lot more quiet this time, as is appropriate for this scenario. Tim did a lot of explaining on the first scenario flight last week. This week was all about letting me figure out when I had problems and at least describe the problem, if not fix it. I’m having that slightly bewildered feeling that usually proceeds a few critical “a-hah!” moments. I’m going to spend some more time with the manual and the PC Trainer to see if I can work out these kinks. I really want to competently fly the next flight with the avionics taking me all the way to minima. Because I’m also going to have to deal with failures and related stuff on that next flight and I really need to have my poop in a group on the fully-functional platform before dealing with failures. The plan is to fly Scenario 3 and then do a fourth flight to put it all together and get the rest of my CAP-required 25 landings before the Form 5 checkride with the wing check airman. I’m planning to fly with LtCol Leo Burke, with whom I’ve not yet flown, the better to get to know him and to fly with as many of the wing check airmen as possible. You learn something new every time you fly with a different check airman and I’m looking forward to that, too. 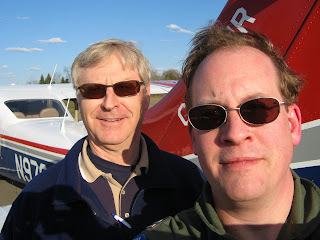 I’ve begin training on the new CAP Cessna 182T Nav III, which is to say a gorgeous 14-month, 450-hour old Cessna 182 with the complete Garmin G1000/GFC 700 avionics system with Capt Tim Kramer, one of the Michigan Wing’s check airmen. 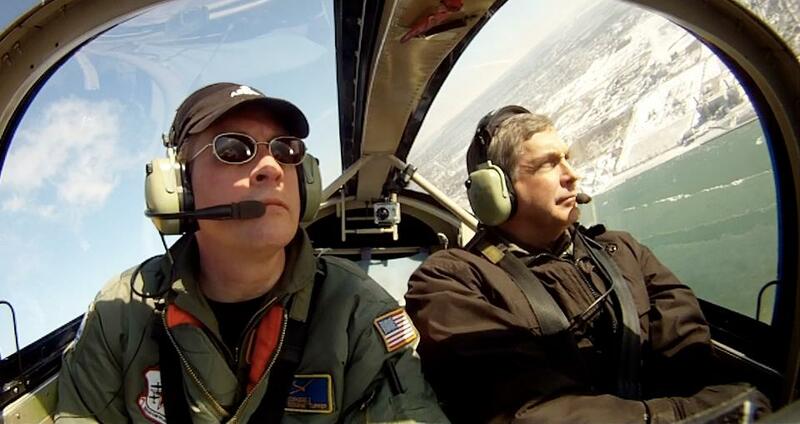 Tim is a real evangelist for the glass system and he’s put something like 15 Michigan Wing pilots through the training in the last year or so. He approached me about getting qualified in it and I jumped at the chance. It’s a great airplane and it’s very capable. It’ll do everything from cruise at 600 AGL at 90 KIAS to haul hiney at 135 KIAS at 10,000 MSL, all while essentially flying itself to ATP standards. I’m an approx. 230-hour pilot with (as it pertains to this kind of flying) an instrument rating and complex and high-performance endorsements. And I’m as competent with electronic systems as anyone I know. I was the only primary student that Eamon Burgess ever had from whom Eamon had to take away the VORs. But the G1000 is another animal entirely. The idea with the G1000 is to give the airplane to the autopilot at 800 AGL and let the autopilot fly her until you’re at minimums. Which means a whole new level of understanding the systems and a whole new way of looking at flying. First, I have to know the systems a lot better than I’ve known systems on simpler aircraft in the past. And, most counterintuitive and new of all, I have to become an airplane manager in flight. That’s right. You give the airplane to the autopilot and then you monitor and manage it en route. 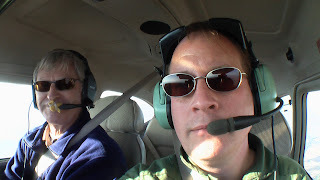 For a guy who’s spent most of the last six or seven years hand-flying airplanes and having instructors ignore the autopilot (even where the airplane has an autopilot in the first place), it’s a really new experience. But it makes a lot of sense. CAP is a professionally-run organization with big shoes (er, boots) to fill. We do 95% of all Air Force supervised inland search and rescue in the United States and we need all of the sophisticated tools we can get. This airplane will help a competent pilot get to and from the search area quickly, accurately, and efficiently and it’ll fly the search pattern automatically to ATP standards. 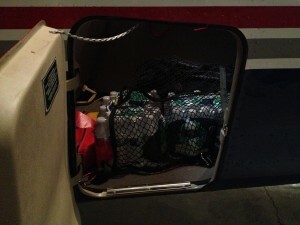 Then it’ll get everybody home for crew rest and to prep for the next sortie. If I’m going to be a valuable asset to the squadron, I need to be able to operate this aircraft to its full capabilities and that’s what this training is all about. And, even if I was just flying CAP’s aircraft for selfish reasons, I’d still want to learn to fly the glass. It’ll be awhile before it becomes hard to find round-gage aircraft to rent, but the time is coming and you need to be comfortable with glass if you expect to fly long-term. The training is very involved, but I’m doing it right. I did a full day in the classroom last year and then Capt Kramer and I spent four hours on the ramp with a ground power unit going over the systems. Only after that did we launch. We did an approx. 200-mile four-point trip around the state last week VFR. Gorgeous day and I learned a lot about the airplane. Friday, we file and do roughly the same thing IFR (I’m planning KPTK KBAX KMBS KJXN KPTK). The third flight will be IFR with gage and system failures. Then the Form 5 checkride in the airplane, probably with LtCol Leo Burke, with whom I have not flown yet. 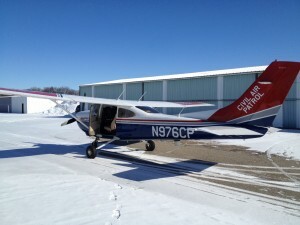 I’m excited about learning to fly and manage this aircraft. 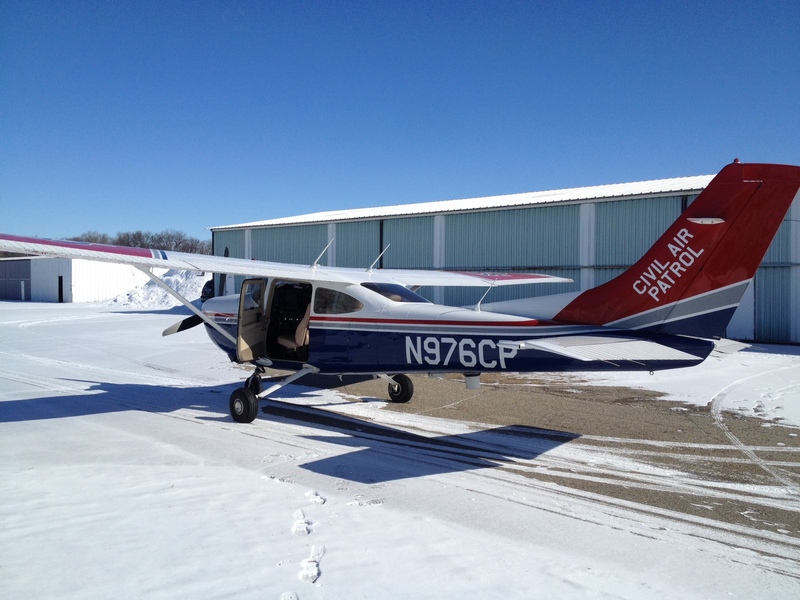 And, by the way, as a Civil Air Patrol pilot, I fly this gorgeous airplane for about $38/hour dry (and fuel runs about 14 gallons/hour – call it $56/hour at $4.00/gal.). You can’t rent a beat-up C-172 wet for $94/hour! And I only pay to fly CAP aircraft when the Air Force isn’t paying for my flights. And the Air Force pays for a fair amount of flying. If you’re a US pilot and not in the US Civil Air Patrol, what the heck are you thinking? Truly! What the heck are you thinking? Yeah, you! 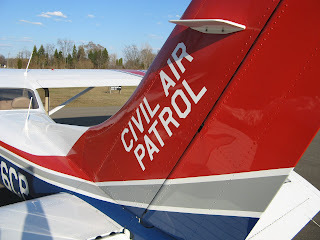 Check out http://www.gocivilairpatrol.com/ for information and a unit near you.